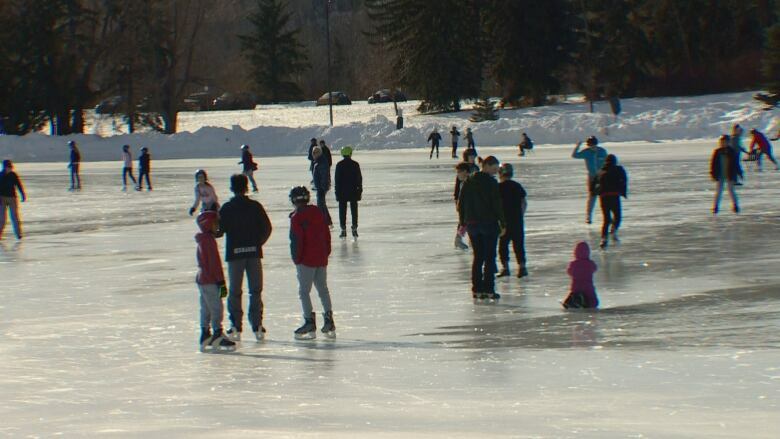 The cold snap predicted to hit Edmonton this weekend is a light on the slushy horizon for people keen to go for a twirl on the Hawrelak Park skating pond. Between the warm weather and accumulated snow, the ice at Hawrelak has been slow to freeze to a safe depth, says Bryan Turner, a team leader with the city's River Valley Parks department. But it finally seems to be coming together, Turner told CBC Radio's Edmonton AM on Tuesday. "We are optimistic about being open next week," he said, which would mean the popular skating area would open in time for the Silver Skate Festival, which begins Feb. 8. According to Environment Canada statistics, average temperatures for this month have ranged from –2 C to –11 C. That is about four degrees warmer than historical average temperatures for the month. But there has also been upwards of 20 centimetres of snow on the ground through January and that, says Turner, is as big a problem as the lack of a sustained cold. "The snow acts almost as an insulating blanket," he said. "It slows down the amount of ice thickness that we get with the cold weather. Plus we haven't been getting very much cold weather." As well, Turner said there have been concerns about inconsistent ice thicknesses. "It's something unusual we haven't seen before and that's also led to the delay," he said. When the ice has frozen to a depth of 25 centimetres, crews can safely take the snow-clearing equipment onto the ice. Clearing the ice will allow it to freeze faster, plus it will let crews start flooding, Turner said. Almost 40 centimetres of ice are needed before water trucks can start doing their work. This could be the latest the skating pond has opened since 1999. City officials could not immediately confirm the opening date for 2016/17; the pond didn't open at all in 2013/14. Otherwise with a few exceptions, it generally opens in the week around Christmas or early January. The late opening has the city contemplating ways to get out on the ice sooner to start snow clearing, with lighter equipment or manual labour. The problem, he said, is that the entire five-hectare surface needs to be fully cleared. Any snow mounds left on the ice can create pressure that causes it to break through. "We can't just make a small surface out there. If you leave a small surface, it's quite dangerous." "Whenever we see that discrepancy out there, we're very cautious and we don't proceed until we know it's safe." A cold front forecast to arrive in Edmonton on Friday will see temperatures ranging from highs of –14 C to lows of –26 C.
Other city ice surfaces include an Olympic-sized land-rink at Hawrelak, the Victoria Park Oval, and rinks at Castle Downs Park, Jackie Parker Park, Rundle Park and The Meadows Community Recreation Centre. There are also two iceways, one each at Rundle and Victoria, and there are skating trails at Kenilworth and Glastonbury community leagues.